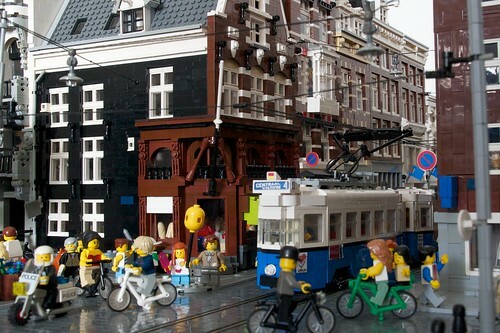 Brick Town Talk: Hustle and Bustle - LEGO Town, Architecture, Building Tips, Inspiration Ideas, and more! Amsterdam, Netherlands - (BTT) Every now and again, it's nice to pull back from the buildings themselves to look at things in the larger context. Just take a look around - a kid with balloons, a mother and daughter on their bike, a tram full of people weaving through the pedestrians using the power lines overhead - you'd be hard pressed to find a more active streetscape. The architecture might be taking more of a background role, but don't for an instant think of that as in insult. Sometimes the best buildings (and this street has some great ones) are content to lay back and let the focus stay on those who get to enjoy them.